According to the civil protection agency, ONEMI, on 18 August OVDAS-SERNAGEOMIN reported that seismicity at Calbuco fluctuated at low levels and continued to decline, and only water vapor emissions rose from the vents. The Alert Level was lowered to Green (the lowest level on a four-color scale). ONEMI maintained an elevated Alert Level of Yellow (mid-level on a 3-color scale) for the Llanquihue and Puerto Octay provinces, and an Alert Level Green for Puerto Montt and Puerto Varas. On 21 August the 10-km exclusion zone around the volcano was lifted, but SERNAGEOMIN warned that the 1.5 km exclusion zone around the craters remained in effect and the public should continue to stay away from drainages. Since an eruption in 1972, Calbuco's activity had been limited to a weak fumarole emission in May 1995 and a strong fumarole emission in August 1996 (BGVN 21:09). No further activity was reported until increased seismic activity and an eruption in April 2015. The volcano is monitored by the Observatorio Volcanológico de los Andes del Sur - El Servicio Nacional de Geología y Minería (OVDAS-SERNAGEOMIN). According to OVDAS-SERNAGEOMIN, Calbuco erupted explosively at 1804 on 22 April 2015, sending an ash plume to more than 15 km above the crater, where it drifted primarily ENE (figure 1). The eruption had been immediately preceded by only 2-3 hours of increased seismicity (one hour of volcano-tectonic events followed by long-period events). During the 90-minute eruption, column collapses occurred locally and radially, affecting the headwaters of major rivers. Figure 1. Photograph of the Calbuco explosion on 22 April 2015, taken from Puerto Montt, about 30 km SW of the volcano. Photo by Keraunos ob, posted on the Earth of Fire blog by Bernard Duyck. On 23 April at 0100 stronger activity began which lasted six hours and generated another ash plume that rose higher than 15 km and drifted NNE and E. Incandescent tephra was ejected as far as 5 km; deposits were concentrated to the N and NE, with thicknesses varying from tens of centimeters in the Región de Los Lagos to a few millimeters in the Los Ríos and La Araucanía regions. Pyroclastic flows traveled a maximum distance of 7 km and lahars traveled 15 km. Pumice fell in Región de Los Lagos, and ash fell in Los Ríos and La Araucanía. Tephra also fell in Argentine territory, NE of the volcano. Several roads and bridges were impassable due to ashfall. Scientists aboard an overflight observed ash emissions from at least six vents on the W, SW, and S sides of the old lava dome. The eruption prompted OVDAS-SERNAGEOMIN to raise the Volcanic Alert Level from Green to Red (highest on a four-color scale). The Oficina Nacional de Emergencia del Ministerio del Interior (National Office of Emergency of the Interior Ministry, ONEMI) called for the evacuation of all people within 20 km of the volcano. About 5,000 residents were evacuated. ONEMI also warned people not to go within 200 m of drainages due to lahar hazards. On 23 April at around 2330, a third period of activity resulted in ash plumes rising 2 km and drifting NE and E. On 24 April the ash plume continued to rise 2 km and explosions were detected. News articles noted that international travel was disrupted; flights in and out of several major cities were delayed or canceled. Thermal anomalies, based on MODIS satellite data, were also observed during 23-24 April. According to one news report, ash from the eruption reached southern Brazil on 25 April, prompting some airlines to cancel flights in and out of Santiago, Buenos Aires, and Montevideo. Some houses in areas near the volcano had collapsed from the weight of the ash. Sporadic explosions caused continued ash plumes 25 April, but to a lower height of 400 m. Seismicity declined during 26-27 April; ash rose 1.5 km, and drifted NE and SE. By 28 April, a satellite-based estimate of sulfur dioxide emissions was 0.3-0.4 Tg (Tg is one million metric tons), detected as high as 21 km altitude. Although most ash had fallen out of the plume over Chile and Argentina, some may have remained in the stratospheric plume drifting around the globe; the leading edge of the gas plume was detected over the Indian Ocean, S of Madagascar. Seismic activity gradually declined, especially after 15 May 2015. OVDAS-SERNAGEOMIN reduced the Alert Level to Orange on 19 May and Yellow on 28 May. During the first part of August 2015, the Alert Level was decreased to Green, the lowest level. However, ONEMI maintained the Alert Level of Yellow for the province of Llanquihue and city of Puerto Octay (45 km NW of Calbuco), and an Alert Level Green for the cities of Puerto Montt (31 km SW of Calbuco) and Puerto Varas (31 km W of Calbuco). According to ONEMI, on 18 August 2015 OVDAS-SERNAGEOMIN reported that seismicity fluctuated at low levels and continued to decline, with only water vapor rising from the vents. On 21 August the 10-km exclusion zone around the volcano was lifted, but SERNAGEOMIN warned that the 1.5 km exclusion zone around the craters remained in effect and the public should continue to stay away from drainages. Information Contacts: Oficina Nacional de Emergencia del Ministerio del Interior (National Office of Emergency of the Interior Ministry, ONEMI) (URL: http://www.onemi.cl/); Observatorio Volcanológico de Los Andes del Sur (OVDAS) del Servicio Nacional de Geología y Minería (SERNAGEOMIN) (URL: http://www.sernageomin.cl/); Hawai'i Institute of Geophysics and Planetology (HIGP) MODVOLC Thermal Alerts System, School of Ocean and Earth Science and Technology (SOEST), Univ. of Hawai'i, 2525 Correa Road, Honolulu, HI 96822, USA (URL: http://modis.higp.hawaii.edu/); Wall Street Journal (URL: http://www.wsj.com/); Reuters (URL: http://www.reuters.com/); Simon Carn, Geological and Mining Engineering and Sciences, Michigan Technological University, 630 Dow Environmental Sciences, 1400 Townsend Drive, Houghton, MI 49931 USA (URL: https://so2.gsfc.nasa.gov/); Earth of Fire Blog (Bernard Duyck), 23 April 2015 (URL: http://www.earth-of-fire.com/archive/2015-04/). On 27 May OVDAS-SERNAGEOMIN reported that seismicity at Calbuco fluctuated at low levels and continued to decline. According to ONEMI, the 10-km evacuation zone remained in effect, with controlled access to some communities allowed for part of the day; about 500 people remained displaced. On 28 May OVDAS-SERNAGEOMIN lowered the Alert Level to Yellow (the second lowest level on a four-color scale). OVDAS-SERNAGEOMIN reported that during 20-26 May activity at Calbuco fluctuated at low levels and continued to decline. Inclement weather prevented observations of the summit area on most days; white plumes were observed rising 300-400 m and drifting SE during 24-26 May, and incandescence at the crater was observed at night during 25-26 May. According to ONEMI, the number of evacuees within the 20-km evacuation zone remained at 6,685 on 26 May. The Alert Level remained at Orange (the second highest level on a four-color scale), and the 10-km-radius exclusion zone continued to be in effect. OVDAS-SERNAGEOMIN reported that during 13-19 May activity at Calbuco fluctuated at low levels and continued to decline. Inclement weather prevented daily observations of the summit area, although incandescence at the crater was observed during 17-18 May. According to ONEMI, the number of evacuees within the 20-km evacuation zone remained at 6,685 on 18 May. On 19 May the Alert Level was lowered to Orange (the second highest level on a four-color scale), and the exclusion zone was changed to a 10-km radius. OVDAS-SERNAGEOMIN reported that on 6 May activity at Calbuco fluctuated; a sudden increase of tremor that began at 1304 and lasted two hours was accompanied by increased gas-and-ash emissions. During 7-11 May the gas-and-ash emissions were steady and low (less than 1 km), and drifted E, SE, and S; inclement weather prevented observations during 8-10 and 12 May. Moderate levels of tremor were detected through 9 May, and then decreased to low levels through 12 May. According to ONEMI, the number of evacuees within the 20-km evacuation zone remained at 6,685 on 12 May. In addition 3,221 animals, including sheep, goats, cows, and horses, had been evacuated. The Alert Level remained at Red (the highest level on a four-color scale). Satellite images showed that the aerosol plume from the initial few days of the eruption had traveled around the world once; faint layers of the plume were 14-16 km above parts of South America during 8-9 May. OVDAS-SERNAGEOMIN reported that an eruption from Calbuco began at 1804 on 22 April, prompting the Alert Level to be raised to Red (the highest level on a four-color scale) and causing a 20-km exclusion zone to be declared. The eruption was preceded by an hour-long period of volcano-tectonic events followed by long-period events; no increases in seismicity had been noted since 2009 when real-time seismic monitoring started. After a large seismic event detected at 1735, a 90 minute eruption generated a sub-Plinian, gray ash plume that rose 15 km above the main crater and drifted mainly ENE, although fine ash drifted N and NW. Column collapses occurred locally and radially, affecting the headwaters of major rivers. Residents within the exclusion zone, in Chamiza, Lago Chapo, and Correntoso sectors, and in the town of Puerto Montt, were ordered to evacuate. Several roads and bridges were impassable due to ashfall. A larger second event on 23 April began at 0100, lasted six hours, and also generated a sub-Plinian ash plume that rose higher than 15 km and drifted N, NE, and E. Incandescent tephra was ejected as far as 5 km; deposits were concentrated to the N and NE, with thicknesses varying from tens of centimeters in the Región de Los Lagos to a few millimeters in the Los Ríos and La Araucanía areas. Pyroclastic flows traveled a maximum distance of 7 km and lahars traveled 15 km. Pumice fell in Región de Los Lagos, and ash fell in Los Ríos and La Araucanía. Tephra also fell in Argentine territory, NE of the volcano. Scientists aboard an overflight observed ash emissions from at least six vents on the W, SW, and S sides of the old lava dome. About 5,000 people had been evacuated and ONEMI warned people not to go within 200 m of drainages due to lahar hazards. At around 2330 a third phase of surficial activity was noted; ash plumes rose 2 km and drifted NE and E. On 24 April the ash plume continued to rise 2 km and explosions were detected. News articles noted that international flights in and out of several major cities were delayed or canceled. According to a news article, ash from the eruption reached southern Brazil on 25 April prompting some airlines to cancel flights using airports in Santiago, Buenos Aires, and Montevideo. Some houses in areas near the volcano collapsed from the weight of the ash. The ash plume persisted on 25 April, but rose to a lower height of 400 m, and sporadic explosions were detected. Seismicity declined during 26-27 April; the ash plume rose 1.5 km, and drifted NE and SE. ONEMI noted on 27 April that 246 of 4,514 evacuees were in shelters; the number of displaced people had peaked at 6,514 during 24-26 April. A satellite-based estimate of sulfur dioxide emissions was 0.3-0.4Tg by 28 April, detected as high as 21 km altitude. Although most ash had fallen out of the plume over Chile and Argentina, some may have remained in the stratospheric plume drifting around the globe; the leading edge of the gas plume had reached the Indian Ocean, S of Madagascar. On the morning of 12 August, the ~250,000 residents of Puerto Montt (35 km SW) and Puerto Varas (36 km SW) were alarmed by strong fumarolic emissions from the 1.5-km-diameter main crater of Calbuco. In May 1995 a weak fumarole was noticed and filmed from a helicopter. Prior to that, Calbuco had showed no signs of activity since a 1972 eruption that lasted for ~4 hours. Calbuco is a very explosive late Pleistocene to Holocene andesitic volcano S of Lake Llanquihue that underwent edifice collapse in the late Pleistocene, producing a volcanic debris avalanche that reached the lake. One of the largest historical eruptions in southern Chile took place from Calbuco in 1893-1894. Violent eruptions ejected 30-cm bombs to distances of 8 km from the crater, accompanied by voluminous hot lahars. Several days of darkness occurred in San Carlos de Bariloche, Argentina (>100 km SE). Strong explosions occurred in April 1917, and a lava dome formed in the crater accompanied by hot lahars. Another short explosive eruption in January 1929 also included an apparent pyroclastic flow and a lava flow. The last major eruption of Calbuco, in 1961, sent ash columns 12-15 km high and produced plumes that dispersed mainly to the SE as far as Bariloche; two lava flows were also emitted. Information Contacts: Hugo Moreno, Observatorio Volcanologico de los Andes del Sur (OVDAS), Universidad de la Frontera, Casilla 54-D, Temuco, Chile. Calbuco is one of the most active volcanoes of the southern Chilean Andes, along with its neighbor, Osorno. The late-Pleistocene to Holocene andesitic volcano is immediately SE of Lake Llanquihué in the Chilean lake district. Guanahuca, Guenauca, Huanauca, and Huanaque, all listed as synonyms of Calbuco (Catalog of Active Volcanoes of the World), are actually synonyms of nearby Osorno volcano (Moreno 1985, pers. comm.). The edifice is elongated in a SW-NE direction and is capped by a 400-500 m wide summit crater. The complex evolution included collapse of an intermediate edifice during the late Pleistocene that produced a 3-km3 debris avalanche that reached the lake. It has erupted frequently during the Holocene, and one of the largest historical eruptions in southern Chile took place from Calbuco in 1893-1894 that concluded with lava dome emplacement. Subsequent eruptions have enlarged the lava-dome complex in the summit crater. Castruccio A, Clavero J, Rivera A, 2010. Comparative study of lahars generated by the 1961 and 1971 eruptions of Calbuco and Villarrica volcanoes, Southern Andes of Chile. J. Volcanol. Geotherm. Res., 190: 297-311. Lopez-Escobar L, Parada M A, Moreno H, Frey F A, Hickey-Vargas R L, 1992. A contribution to the petrogenesis of Osorno and Calbuco volcanoes, Southern Andes (41° 00' - 41° 30' S). Rev Geol Chile, 19: 211-226. Moreno H, 2004. Osorno-Calbuco. IAVCEI Gen Assembly 2004 Pucon, Chile Field Trip Guide C4, 14 p.
There is data available for 37 Holocene eruptive periods. There is no Deformation History data available for Calbuco. 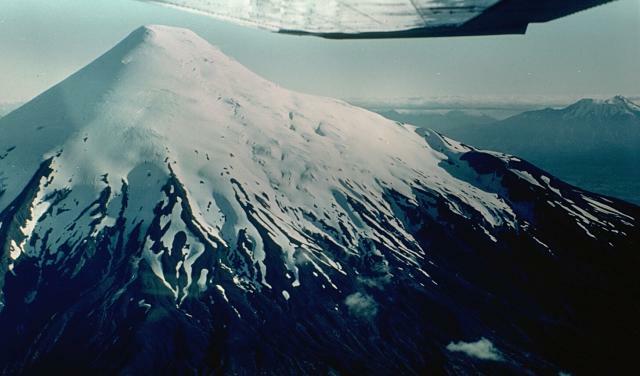 The symmetrical, glacier-clad Osorno stratovolcano forms a renowned landmark between Todos Los Santos and Llanguihue lakes. It is seen here from the north, with Calbuco volcano visible at the extreme right. 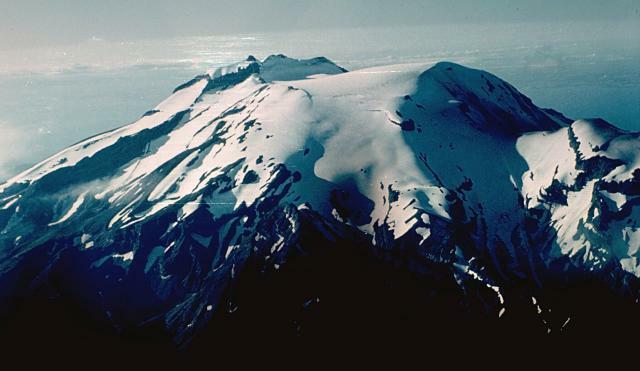 The 2652-m-high Osorno is one of the most active volcanoes of the southern Chilean Andes. Flank scoria cones and fissure vents, primarily on the west and SW sides, have produced lava flows that reached Lago Llanguihue. Historical eruptions have originated from both summit and flank vents. Calbuco is one of the most active volcanoes of the southern Chilean Andes. The isolated volcano rises to 2003 m south of Lake Llanquihue, which is visible at the upper right. The summit ridge (center) of the volcano is the remnant of an older volcano that collapsed during the late Pleistocene and produced a 3 cu km debris avalanche that reached the lake. Subsequent eruptions generated andesitic lava flows, breccias, and tuffs that filled the scarp and were subsequently topped by an historical lava-dome complex (right center). Along with its neighbor Osorno (upper left), Calbuco is one of the most active volcanoes of the southern Chilean Andes. The summit of Calbuco, seen at the left in this view from the SW, is the remnant of an older volcano that collapsed during the late Pleistocene, producing a debris avalanche that swept NNW into Lake Llanquihue. 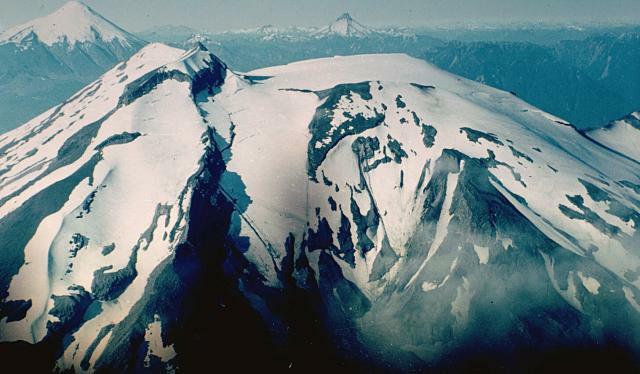 The smooth, snow-covered summit at the right is a young, historical lava-dome complex that postdates one of the largest historical eruptions in southern Chile during 1893-1894. Large Eruptions of Calbuco Information about large Quaternary eruptions (VEI >= 4) is cataloged in the Large Magnitude Explosive Volcanic Eruptions (LaMEVE) database of the Volcano Global Risk Identification and Analysis Project (VOGRIPA).